The Court has jurisdiction over this action pursuant U.S.C. 1331. 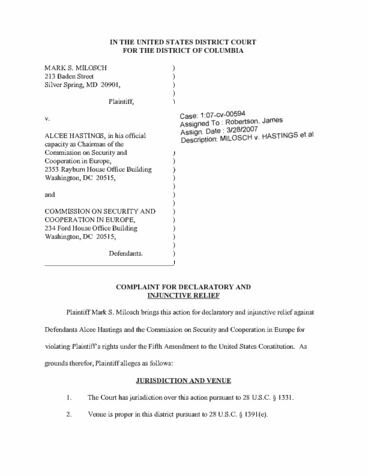 Plaintiff U.S. citizen and resident the State Maryland. Plaintiff resides 213 Baden Street, Silver Spring, 20901. Defendant Alcee Hastings the Chairman the Commission Security and Cooperation Europe. Defendant Hastings also member the U.S. House Representatives and has his principal place business 2353 Rayburn House Office Building, Washington, 20515. Defendant Hastings being sued his official capacity Chairman the Commission Security and Cooperation Europe. Defendant Commission Security and Cooperation Europe ("CSCE") independent agency the United States Government. Defendant CSCE has its principal place business 234 Ford House Office Building, Washington, 20515.
even-numbered Congresses, the Chairman selected the Speaker the House Representatives and the Cochairman selected the President the Senate, the recommendation the majority leader. odd-numbered years, the selection process reversed. The statute establishing Defendant CSCE also establishes both commission staff and personnel and administration committee composed the Chairman, Cochairman, and the ranking commission member from the minority party both the House Representatives and the Senate. law, "[a]ll decisions pertaining the hiring, firing, and fixing pay Commission staff personnel shall majority vote the personnel and administration committee .... U.S.C. 3008(b) (emphasis added). longstanding practice, the personnel and administration committee has made employment decisions amicably, through "notification and right object" process. When employment action proposed, other members are afforded reasonable opportunity object. objection made, the proposed employment action proceeds. 10. addition, Defendant CSCE has long history continuity staff regardless which party controls one both houses Congress. This non-partisan continuity staff has been recognized and valued Defendant CSCE's members. objections are required block firing. Plaintiff holds Bachelor Arts International Relations from Michigan State University, Juris Doctorate from the University Michigan Law School, Certificate Study from the Bologna Center the John Hopkins University Paul Nitze School Advanced International Studies, and Doctorate Philosophy European History from the University Iowa, among other academic achievements. Prior 2006, Plaintiff served for three years Special Advisor the Congressional-Executive Commission China, where focused issues religious freedom and population planning China. also has worked Instructor History the University lowa and attorney private practice. addition his impressive academic and research credentials and extensive expertise, Plaintiff member the State Bar Michigan, published author, and speaks multiple languages, including German, Italian, French, and Romanian. 13. approximately November 30, 2006, Plaintiff was hired serve counsel Defendant CSCE. Plaintif employment was effectuated through the "notice and right object" process longstanding use Defendant CSCE. counsel, Plaintif duties and responsibilities included monitoring rule law issues and "country responsibility" for Romania, Germany, and France. Defendant CSCE' history non-partisan continuity staff. 15. January 2007, control the U.S. House Representatives changed hands. Because the new Congress was even-numbered Congress, the new Speaker, Nancy Pelosi, gained the authority designate the new Chairman Defendant CSCE. Speaker Pelosi designated Defendant Hastings serve Chairman Defendant CSCE. 16. January 2007, Defendant CSCE had professional staff approximately eighteen professional staff members, including Plaintiff. 17. late January, 2007, shortly after assuming the chairmanship Defendant CSCE, Defendant Hastings began efforts terminate the employment least four members Defendant CSCE's professional staff, including Plaintiff. 18. February 2007, the two incoming ranking members the personnel and administration committee, Senator Sam Brownback and Representative Christopher Smith, sent letter Chairman Hastings objecting the dismissal Plaintiff and the other professional staff members. One the professional staff members apparently agreed resign. Nonetheless, Defendant Hastings has ignored the objections Senator Brownback and Representative Smith and proceeded with the termination the other three professional staff members, including Plaintiff. Plaintiff enjoys property right his continued employment Defendant CSCE. Defendants have deprived Plaintiff this property right without due process law violation the Fifth Amendment the U.S. Constitution. Specifically, Defendants have caused Plaintiff fired without majority vote the personnel and administration committee and over the objection the two minority party members the committee. Plaintiff has been irreparably harmed reason Defendants' violation his constitutional rights. WHEREFORE, Plaintiff respectfully requests that the Court: (1) declare Defendants' termination Plaintiff's employment unlawful; (2) enjoin Defendants restore Plaintiff his pre-termination employment; (3) grant Plaintiff award attorney's fees and other litigation costs reasonably incurred this action; and grant Plaintiff such other relief the Court deems just and proper.